This book is for anyone working in the health system (e.g. psychologist, GP, nurse, dentist, receptionist). It gives some ideas on how they can make reasonable adjustments to make their services more effective for people on the autistic spectrum.Everything in this book has been drawn from real life experiences. The girl with the curly hair has had some brilliant therapists, but also some people who really did not understand her needs. I found this book really useful both as a professional working with people on the spectrum and as a parent of a teenager on the spectrum. The information is clearly presented, nicely spaced out and supplemented with graphics, which make it easy to read and digest. Particularly useful was how approaching CBT for anxiety may be different for someone on the spectrum with regards to recognising and expressing emotions as well as thoughts about anxiety being different from what is usually experienced by someone who is neuro-typical. I have successfully used parts of this book with my daughter, her counsellor and patients in my private practice. 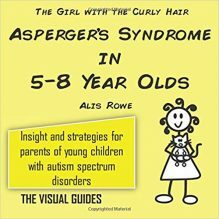 in This book Alis gives ideas and advice on how People in the health and mental health sector affects people with Aspergers there are some great diagrams in the book on how The therapist or doctor can help the aspie and to understand what it is like for us. I bought this book to help me understand myself better at this time when I was in therapy sessions which weren’t helpful. This should be required reading for all CAMHS therapists and adult psychiatric services as well as anyone in health who may work with those on the autism spectrum. This for me as a GP is the most important book by the Girl with the Curly hair. It is so much better than any training on the subject which a professional who has not lived with or inside autism spectrum difference telling others how to make reasonable adjustments. I cannot praise it enough. Alis has provided really clear guidance regarding the problems individuals with ASD face accessing health services and easy adaptations that can be made by professionals. This should be compulsory reading. Clearly laid out and very insightful. Explaining the differences between how thoughts and feelings may be experienced was very useful as well as the impact of anxiety on thoughts.